Hi, with the cold weather it is important to winterise your outside taps....even if they are frost free ones. The reason I say about frost free ones, is because if they were not installed at the correct angle, they can still freeze, causing burst pipes. Close the shut off valve inside the home, you may have multiple shut off valves depending on how many taps you have. 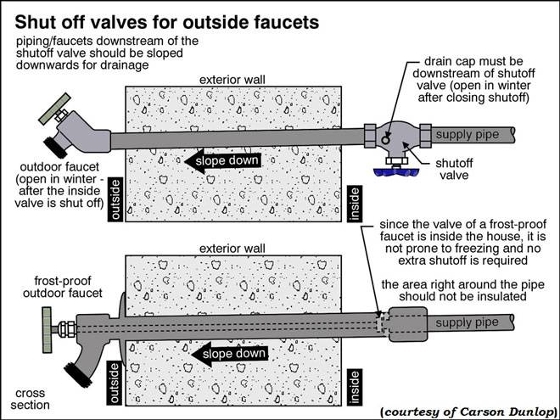 Most homes however will have all outside taps leading to one shut off valve. Open the outside taps and allow them to drain. Leave it open incase the tap pressures up due to a faulty shut off valve. Check throughout the winter to make sure no icicles are forming due to a leaky shut off valve. Go back to your shut off valve inside the house with a bucket, place the bucket underneath the shut off valve and open the bleeder valve. This is a little screw valve normally located at the shut off valve. Opening this valve will remove any remaining water from the pipe in the wall. Close the bleeder valve and your exterior water taps are winterized.